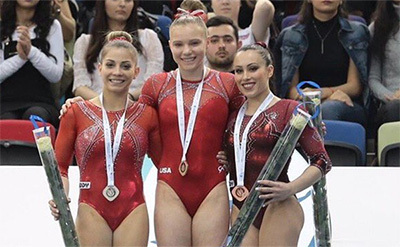 BAKU, Azerbaijan, March 17, 2019 – Jade Carey of Phoenix, Ariz./Arizona Sunrays, won the women’s floor exercise title earlier today at the International Gymnastics Federation’s World Cup in Baku, Azerbaijan. She also brought home the vault gold medal and the AGF Trophy for the women’s highest execution score in the preliminaries. U.S. fans who missed the livestream can watch a telecast of today’s finals twice: today, a 5:30 p.m. ET telecast on the Olympic Channel, with a simulcast; and tomorrow, March 18, a NBCSN telecast 12 p.m. ET with a simulcast. Carey’s floor exercise routine yielded a 14.600, putting her ahead of Italy’s Lara Mori (13.866). Italy’s Vanessa Ferrari was third with a 13.733. Australia’s Emma Nedov was the balance beam champion (14.100). Colin Van Wicklen of Magnolia, Texas/University of Oklahoma, finished fifth on the men’s vault, earning a 14.599 (14.566/14.633). Korea’s Yang Kakseon took the title at 14.970, with Ukraine’s Igor Radivilov in second at 14.833, followed by Russia’s Denis Abliazin in third with a 14.766. The other men’s champions from today were Japan’s Kohei Kameyama on pommel horse and the Netherlands’ Epke Zonderland on the horizontal bar.